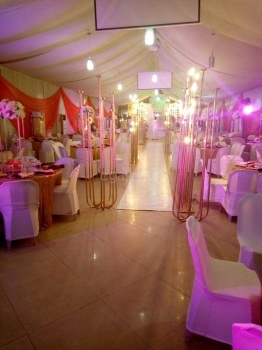 Platinum Hall is Marquee tent located on a spacious landmass within the premises in a serene and secured environment of Ikeja with full AC. 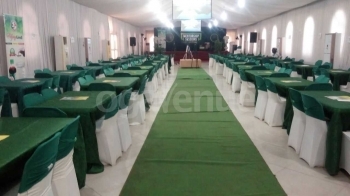 Our hall is suitable for all kinds of events with a capacity of 500 guests (banquet). Q: What type of chairs does Our Place Event Centre Platinum Hall provide? Q: What type of tables does Our Place Event Centre Platinum Hall Provide? Q: Is there parking space at Our Place Event Centre Platinum Hall? Q: Does Our Place Event Centre Platinum Hall provide power? Q: Does Our Place Event Centre Platinum Hall have Restrooms? Q: Does Our Place Event Centre Platinum Hall allow external Decorator? Q: Does Our Place Event Centre Platinum Hall provide security? Q: Does Our Place Event Centre Platinum Hall allow you bring in your food and drink? 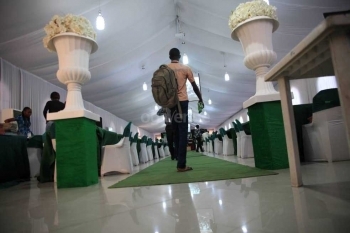 Q: What type of flooring does Our Place Event Centre Platinum Hall have? Q: Does Our Place Event Centre Platinum Hall have Drappings? Q: Does Our Place Event Centre Platinum Hall have a stage? Beautiful tent. Though the number of guest that finally showed up for the event was more we were still able to sort things out. They had people on ground through out to assist, they really did well. Sorry, not available at Our Place Event Centre Platinum Hall. Kindly check out other available dates or check out other venues in Ikeja that match your requirements.